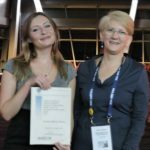 Two talented Hudson Institute, Centre for Reproductive Health, PhD student researchers were successful award recipients at the SRB August 2018 Conference held in Adelaide. Anastasia Christine Kauerhof, exchange IRTG PhD student from Giessen Liebig University, Germany, won the Hudson Institute ECR Award for her poster, entitled: ‘Investigation of intratesticular inflammatory responses in humans and mice implicated activin A as a potential inducer of fibrosis in the testis’. She was presented with her award by Professor Kate Loveland, Hudson Institute, Centre for Reproductive Health Centre Head. Christine’s supervisor is Professor Mark Hedger, Head, Endocrinology and Immunophysiology Laboratory. 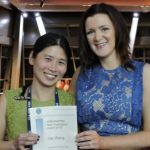 Centre for Reproductive Health, Implantation and Placental Development Laboratory PhD student, Yao Wang, received an ANZPRA New Investigator Award, presented to her by Dr Natalie Hannan. She was acknowledged for her talk, entitled: ‘High levels of circulating HtrA4 may contribute to the development of preeclampsia by cleaving the main cell surface receptor of VEGFA to induce systemic endothelial dysfunction’. Preeclampsia is a serious pregnancy disorder that is associated with widespread endothelial dysfunction. However, there is no effective treatment other than premature delivery. 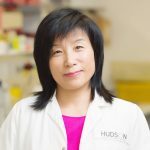 Yao’s studies discovered that HtrA4, a placenta-derived protease that is circulating at a high concentration in the blood of preeclamptic patients, could cleave the main VEGFA receptor in endothelial cells to induce impairment of angiogenesis. 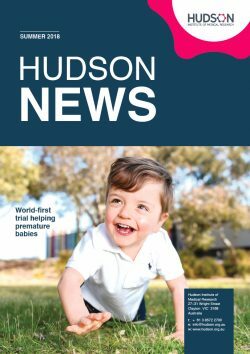 These results are significant as they identified HtrA4 as a potentially important causal factor of preeclampsia and a unique target for treatment. Yao’s supervisor is Professor Guiying Nie. This news article was posted on 27 August, 2018 . It was last updated on 31 January, 2019 .